For France U16 the international youth basketball season starts with the traditional "Tournoi International du Poinçonnet" during the Easter holiday. A week before the event, 24 March - 28 March 2013, 18 players from the 1997-1998 generations attend the first training camp of the year in Bourges. This season Julien Egloff is responsible for the French U16 programme and he is assisted by David Galois and Xavier Noguera. Egloff has at least four training camps and three preparation tournaments before the main youth basketball event, the U16 European Championship in August 2013. The first training camp gives the selectors a chance to make a first evaluation of players before making the final selection of players to prepare for the European Championship. 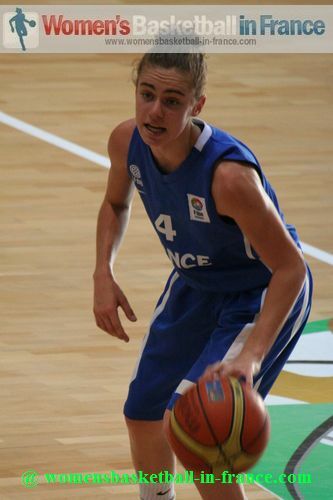 Alix Duchet (in picture) is the only player called up that had played for France last summer at the U16 European Championship. Margot Bienvenu who is also on the list participated in the first training game last season. She was not called up for further camps despite making the selection for the CFBB. Afin de constituer le futur groupe France cadette qui participera cet été au Championnat d'Europe du 1er au 11 août en Bulgarie, l'entraîneur de l'Equipe de France U16, Julien Egloff, réunira 18 joueuses (de 1997-1998) à Bourges du 21 au 28 Mars 2013 pour effectuer un premier stage d'évaluation.